امروزه پایداری به‌عنوان رویکردی غالب برای توسعه گردشگری روستایی، مورد توجه برنامه‌ریزان و محققان این حوزه است. بر همین اساس در پژوهش حاضر سعی گردیده تا با تعیین ظرفیت تحمل بر مبنای نحوه نگرش جامعه میزبان به گردشگری بستر مناسبی برای نیل به توسعه پایدار گردشگری در روستای قلات (شهرستان شیراز) فراهم گردد. به‌منظور گردآوری داده‌ها و اطلاعات مورد نیاز از دو روش اسنادی و میدانی و به‌منظور تجزیه و تحلیل آن‌ها از روش‌های آماری (توصیفی استنباطی) و روش SWOT استفاده شده است. جامعه آماری این پژوهش شامل خانوارهای ساکن و گردشگران روستای مورد مطالعه است که بر اساس روش کوکران تعداد 263 خانوار و نیز 263 گردشگر به‌عنوان حجم نمونه تعیین و به روش نمونه‌گیری تصادفی انتخاب گردیدند. با توجه به اثرات و پیامدهای درک شده از سوی ساکنین محلی نتایج به‌دست آمده نشان از نامطلوب بودن ماهیت توسعه گردشگری و نزدیک شدن به آستانه اشباع ظرفیت تحمل گردشگری در روستای مورد مطالعه داشت که البته در این ارتباط تفاوت معناداری بین دیدگاه جامعه میزبان بر اساس وضعیت شغلی آن‌ها وجود داشت. هم‌چنین نتایج بررسی‌ها نشان داد راهبرد تدافعی به‌عنوان راهبردی برای سیاست‌‌گذاری و برنامه‌ریزی گردشگری در روستای مورد مطالعه می‌بایست مورد توجه قرار گیرد. Nowadays, sustainability is considered by planners and researchers to be a dominant approach for development of rural tourism. In this respect, a variety of research studies have been done for studying this paradigm leading to introduction of various conceptual frameworks such as sustainability and strategic planning of tourism development. 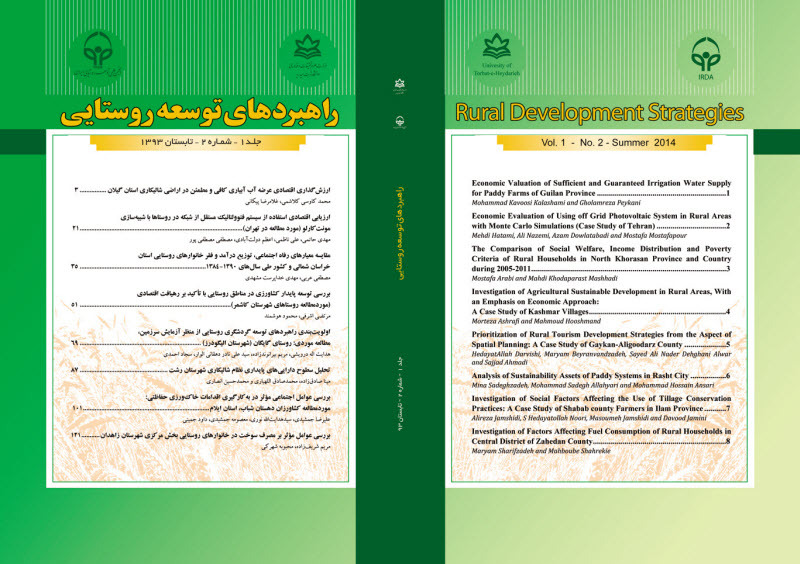 In this way, the present study attempts to provide a convenient basis for sustainable tourism development in the Qalat village located in the Shiraz sub-province through determining the sustainability based on the viewpoints of the host society about on tourism, and offering the appropriate strategic plan. This study is an applied research with the descriptive analytic method. The needed data has been gathered through library studies and field work. Descriptive statistical methods were carried out for data analysis. Statistical population of the research includes tourists and local native families. Analysis of local residents' perceptions shows undesirability of tourism development and approaching the threshold of saturation of sustainability of the tolerance of tourism. Yet, there exists a significant difference among the host society population's view based on their employment condition. Considering the results of this study, adopting a defensive strategy is necessary in the policy making and planning development of rural tourism in the village under study. افتخاری، ع.، مهدوی، د. و اکبری سامانی، ن. 1392. ارائه الگوی برنامه­ریزی راهبردی توسعه گردشگری پایدار روستایی (مطالعه موردی: دهستان لواسانات کوچک). فصلنامه پژوهش­های جغرافیای انسانی، 1: 146-123. افتخاری، ع.، مهدوی، د. و پورطاهری، م. 1390. فرآیند بومی­سازی شاخص­های توسعه پایدار گردشگری روستایی در ایران. فصلنامه پژوهش­های روستایی، 4: 41-1. پاپلی یزدی، م. ح. و سقایی، م. 1385. گردشگری (ماهیت و مفاهیم). انتشارات سمت، تهران، 284 ص. تولایی، س. 1386. مروری بر صنعت گردشگری. انتشارات دانشگاه تربیت معلم، تهران، 232 ص. رضوانی، م. ر.، اکبریان رونیزی، س. ر.، افتخاری، ع. ر. و بدری، س. ع. 1390. تحلیل مقایسه­ای آثار اقتصادی گردشگری خانه های دوم با گردشگری روزانه بر نواحی روستایی با رویکرد توسعه پایدار مورد مطالعاتی: شهرستان شمیرانات. پژوهش­های روستایی، 4: 63-35. رضوانی، م. ر. 1387. توسعه گردشگری روستایی با رویکرد گردشگری پایدار. انتشارات دانشگاه تهران، تهران، 400 ص. رهنمایی، م. ت.، فرهودی، ر.، دیتمان، آ. و قدمی، م. 1387. بررسی ظرفیت تحمل حوزه مقصد گردشگری با تأکید بر جامعه میزبان، نمونه موردی: مطالعه شهر کلاردشت. پژوهش­های جغرافیای انسانی، 66: 17-33. ضیائی، م. و شکاری، ف. 1392. ظرفیت تحمل اجتماعی و واکنش­های رفتاری دیدارکنندگان به ازدحام در سایت­های طبیعی. مجله برنامه ریزی و توسعه گردشگری، 3: 51-30. علیزاده، ک. 1382. اثرات حضور گردشگران بر منابع زیست محیطی (مورد: بخش طرقبه در شهرستان مشهد). فصلنامه پژوهش­های جغرافیایی، 44: 70-55. علیقلی­زاده، ن. 1386. اثرات گردشگری بر نواحی روستایی از دیدگاه جامعه میزبان مورد: بخش مرکزی شهرستان نوشهر. رساله دکتری، دانشگاه تهران. قدیری معصوم، م.، استعلاجی، ع. و پازکی، م. 1389. گردشگری پایدار. انتشارات دانشگاه تهران، تهران، 256 ص. کدیور، ع ا. و سقایی، م. 1385. ساماندهی گردشگری در تفرجگاه­های پیرامون شهری مطالعه موردی دره اخملد. فصلنامه تحقیقات جغرافیایی، 38: 134-111. مرکزآمار ایران. 1390. سرشماری عمومی نفوس و مسکن. قابل دسترسی در: www.amar.org.ir، آخرین دسترسی: 6/4/1392. هادیانی، ز.، احدنژاد، م.، کاظمی زاد، ش. و قنبری، ح. 1391. برنامه­ریزی راهبردی توسعه گردشگری بر اساس تحلیل SWOT مطالعه موردی: شهر شیراز. فصلنامه جغرافیا و برنامه ریزی محیطی، 3: 132-111. Brida, J. G., Disegna, M. and Osti, L. 2010. Resident’s perceptions of tourism impacts and attitudes towards tourism policies in a small mountain community. Competence Centre in Tourism Management and Tourism Economics (TOMTE), Free University of Bozen-Bolzano, School of Economics and Management, Bolzano, Italy, 9(1): 37-71. Butler, R. W. and Hall, C. M. 1998. Tourism and Recreation in Rural Areas, joh Wiley and Sons, Chic ester, 261p. Butler, R. W. 1993. Tourism An evolutionary perspective. In J. G. Nelson, R. Butler, & G. Wall, Tourism and sustainable development: monitoring, planning, and managing . Waterloo: Heritage Resources Centre, University of Waterloo, 2643 p.
Byrd, E., Bosley, H. and Dronberger, M. 2009. Comparisons of stakeholder perceptions of tourism impacts in rural eastern North Carolina. Tourism Management, 30: 693-703. Choi, H. C. and Sirakaya, E. 2005. Sustainability indicators for managing Community tourism. Journal of Tourism Management, 27:1274-1289. Harris, R. and Leiper, N. 1995. Sustainable tourism: An Australian perspective. Australia: Butterworth Heinneman,156 p.
Holjevac, I. 2003. A vision of tourism and the hotel industry in the 21st Century. Hospitality Management, 22: 129-134. Liu, Z. 2003. Sustainable tourism development: A critique. Journal of Sustainable Tourism, 6:459-475. Mowforth, M. and Munt, I. 1998. Tourism and sustainability: New tourism in the Third World. London: Routledge. Ross, S. and Wall, G. 1999. Ecotourism: Towards congruence between theory and practice. Journal of Tourism Management, 20: 123–132. Saveriades, A. 2000. Esablishing the social tourism carrying capacity for the tourist resorts of the east coast of the republic of Cyprus. Tourism managmant, 21:147-156. Sharpley, R. 2002. Rural Tourism and the Challenged of tourism diversification: the case of Cyprus. Tourism Management, 23: 233-344. Soteriou, E. C. and Coccossis, H . 2010. Integrating Sustainability into the Strategic Planning of National Tourism Organizations. Journal of Travel Research, 49: 191–205. Stokes, R. 2008. Tourism strategy making: Insights to the events tourism domain. Tourism Management, 29: 252–262. Tosun, C. 1998. De"cits in approaches to tourism development planning in developing countries: The case of Turkey. International conference of international travel and tourism: Policy, law and management, Newcastle upon Tyne: University of Northumbria. 19-21 April 1998. Tosun, C. 1996. Approaches to tourism development planning at subnational level: A case study of Cappadocia in Turkey. Unpublished MPhil thesis, Strathclyde University, The Scottish Hotel School, Glasgow, UK.